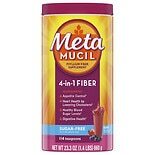 Shop Metamucil Multi-Health Psyllium Fiber Supplement Sugar-Free Powder Berry (23.3 oz. )23.3 oz. $2199$21 and 99 cents$0.94 / oz. 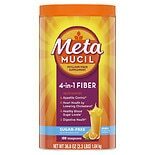 Shop Metamucil Multi-Health Psyllium Fiber Supplement Sugar-Free Powder Orange (36.8 oz. )36.8 oz. $2999$29 and 99 cents$0.81 / oz.